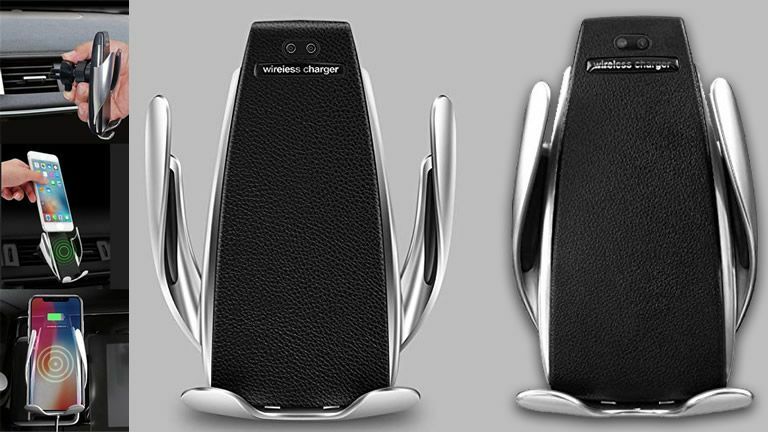 A powered auto-clamping wireless charger that hugs your phone! You gotta watch the video to understand this one - it's like it's giving your phone a big hug! This auto-clamping wireless phone charger for your car is one of the coolest products we've seen this year. The motion sensor lets you wave your hand over it to open, then automatically closes once your phone is placed inside. To open it up again, just wave your hand on the side. And if your phone supports wireless charging, you're in luck - it's also a wireless charger! Once your phone is resting in the cradle, charging will start automatically. Mounts via suction cup or air vent clip.